Well its official..the crib is out of our house..we no longer even own a crib and while I have agonized over the years whether my boys would be in same room, in bunk beds, etc….for now we found a configuration that works…and new pillows that they could care less about but give mama joy in the chaos..so here it is ..our TINY room for two big rowdy boys, ages 2.5 and 7.5. Just a recap, the room looked like this (click and scroll to last page of article) when it was Drew’s nursery, like this when it became Henry’s nursery, then the boys started sleeping in the same room and it changed to this and now the crib is gone and we have tweaked some more! This is the fastest changing room in our house no doubt! This is what you seen when you walk in the room..i mean RIGHT when you walk in the room…we are talking 10×11 feet packed full of two twins, an armoire, a large dresser and two growing boys. It is a lot but i know one day they will be grown and i will love the memories of them sleeping in this tiny room together with the cowboy curtains. The dresser is an amazing antique. I bought it from a friend and its one of my favorite pieces ever..the COLOR and it has huge drawers so great storage…and its so large and snug with the beds it almost gives a built in feel..and its so heavy and sturdy we can lean against it with pillows when snuggling and reading to the boys..even my husband commented on the cozy cocoon the dresser makes..so i got built ins without building. The “headboards” are obviously decals from here..I love the simplicity and frankly i do not even have 2 extra inches for a plain upholstered headboard! My plan was to trace these and paint them on wall but as much as we change things around here i may just leave them so later i can simply peel off! The pillows and bedskirts were made by Tootledoo Designs a sponsor here on my blog..The owner of the shop, Mary John, does amazing work and has an etsy shop..she also has a new baby any day so if you contact her and she doesn’t answer an email right away..give her time! 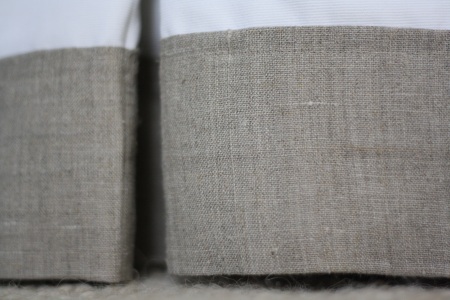 Bedskirt details..love the linen band! The rug is the wool jute from PB..soft and durable. The galvanized light has been up a while, its from Barn Light Electric! Can you tell i love this bedskirt..its nicer than the one on my bed! Man i hope it doesn’t get blood or poop on it BUT if they get stained i can switch them and put the stained side against the walls..i have a plan! For the longest i knew I wanted big monogrammed pillows for the boys but I didn’t want embroidered monograms because of snag issues..Mary John came to the rescue with these appliques..and the piping..her sewing is so great! 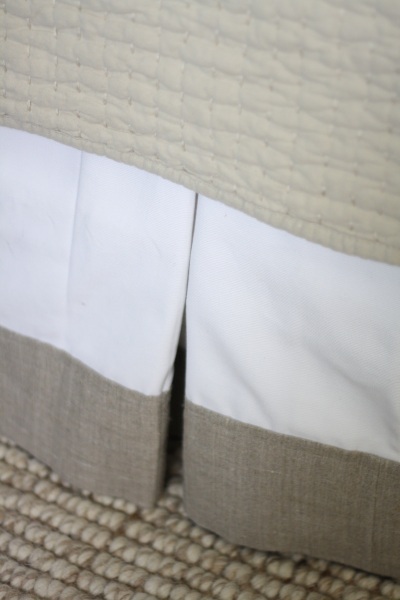 The quilt and sham are pickstitch from Pottery Barn..it washes well! A few details around the room…old hymnal rack painted white for books, star sheets from Serena and Lily and bla bla friends. The vintage red box on the dresser is large and holds school papers and art I want to save..good place to stash it quickly! The cowboy curtains have been here a while and the colors of the new bedding were chosen to go with the drapes..i love them. 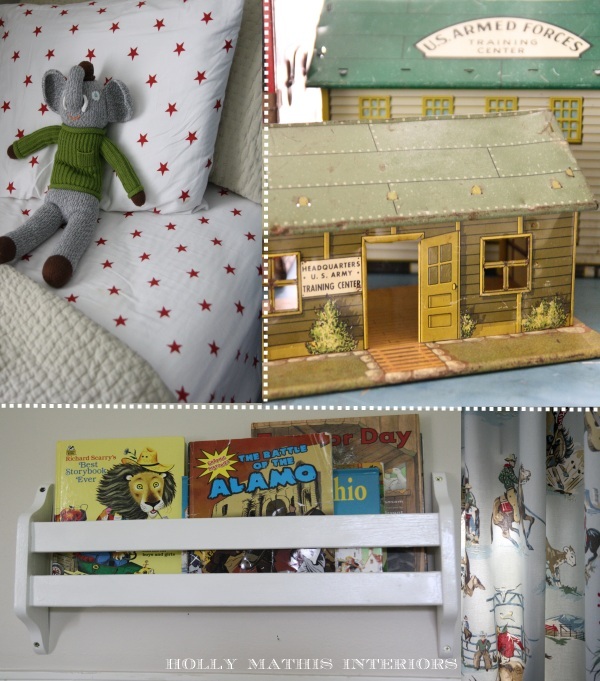 We don’t keep many toys in this room..most are in the living room or in playroom upstairs but these vintage army barracks are treasures from a local thrift shop! Opposite the bed wall is a green painted chalk wall with the verse from Isa 61 that is my prayer for my boys..that they grow to be “oaks of righteousness,plantings of the Lord and displays of his splendor!” I had another piece on this wall for storage but recently replace with this old armoire that i painted in white annie sloan chalk paint by these amazing furniture painters! Notice the tag on the drawers, that is an unfinished project..my goal is to organize Henry’s clothes in these drawers and label to help Nana, Daddy and the sitter with finding where things are located but as you can see this has not happened yet..but good idea..I figure by the time they get grubby and or Henry tears the tags off everyone will know where things go! 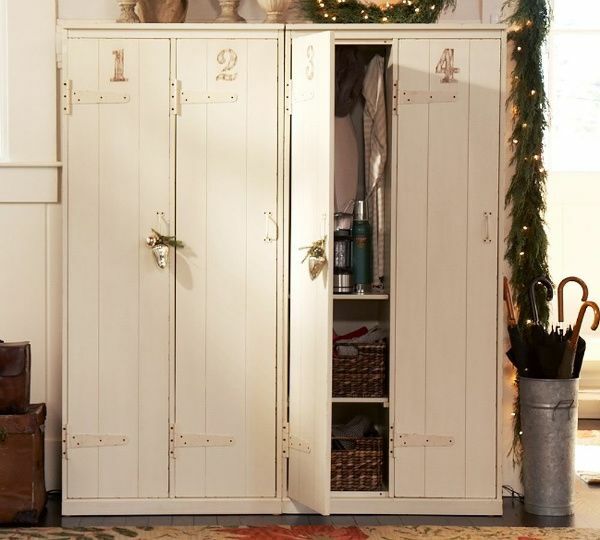 Like i said, i had another piece on this wall, white numbered lockers from PB but i had to send them back..too bad…cute but very slick and fake in person..not authentic rustic at all. And they smelled of CHEMICALS which is a not good storage for kids pjs and sheets…BUT Pottery Barn made it good.full refund including shipping! 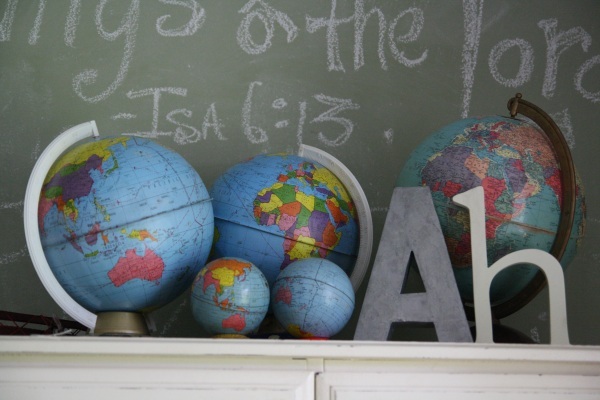 Love their old globe collection..and of course A is for Andrew and h is for little brother Henry. I also bought two of these dash and albert blankets for extra cover..i love them because they fold up easily and small and can stash in armoire or wherever…I was excited when I found out DA makes blankets..i like their rugs but never have been able to get one to work..i wanted one in this room but the wool is more practical believe it or not..and comfy and warm in our old house winters! Thanks for looking at the big boy(s) room! If you pop over don’t expect it to look this neat especially on a Monday morning but it does feel good to have it finally finished, for now! Homegirl, you rocked this one out! I am currently attempting to put two GIRLS together…..hmmmm, maybe I should hire you to do it :)! Well done friend. It’s a great space. Gorgeous!! I love it. It makes me want to move my 2 boys in together… although, at this point, I think the almost 7 year old would kill me for it! What amazing memories they are making together and what a fantastic room to make them in. I love EVERYTHING about this…the colors especially and the black and white photos. We could just pick this room up and move it to my house for my 2 boys, you know? That bedskirt is wonderful…you have my brain spinning on making this for my oldest son’s bed. 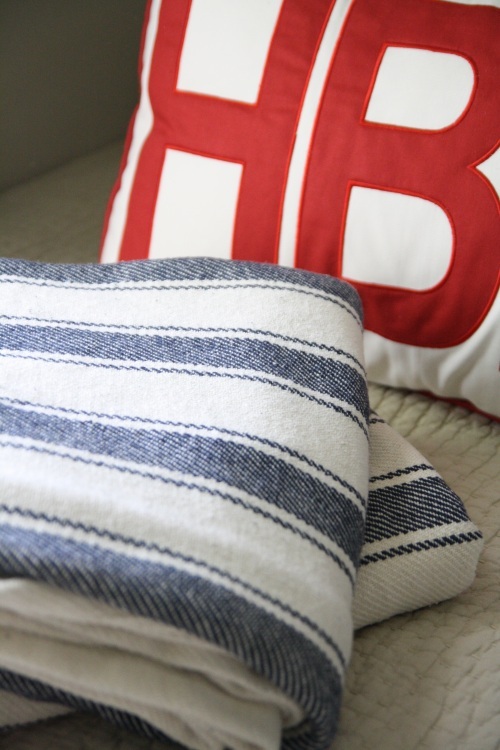 Really love the monogram pillows. THAT is how you should do monograms for boys. I love seeing the evolution of a room for children! As always, looks great! As someone who lives in an old house with small rooms I know how hard it can be to get all the storage you need while keeping the room open. You did just that and it looks Amazing too!! The bed decals are such a smart idea, I had to look again just to see, I thought they were real headboards! All over great room. 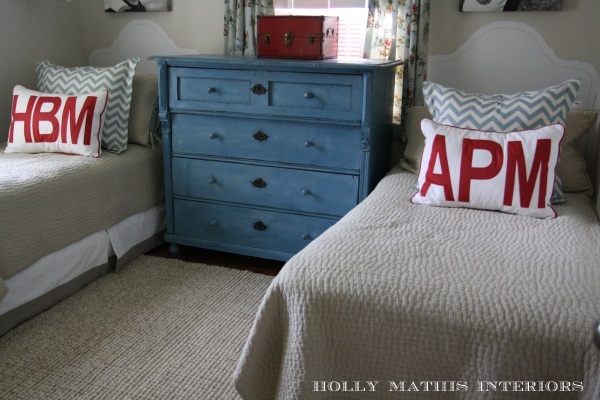 The monogram pillows and bedskirts are my absolute favorite. So darling. I love the old school green chalk board and that you kept your old shutters on the windows. Children take such pride in their spaces when they look nice and are organized. Very lucky boys! 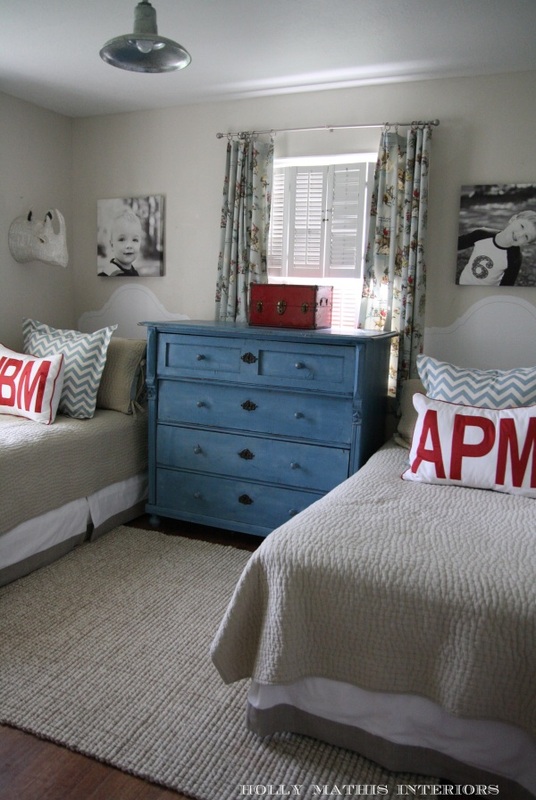 oh, your boys’ room is absolutely darling and so cozy! I bet they are loving the joy of a new room together! Your posts are always such a highlight to my day. Thank you for the lovely and talented inspiration! I LOVE your boys’ room! It is comfortable and darling – though my own two boys’ beds would NEVER be that well made! Have a great week! Love, love, love it! These are very similar to the colors I plan to use for my son’s big boy room in a few years, er months (tear). I got a lot of great ideas from your pictures, thanks! Love their room! My 4 boys share a room (their choice so they can have a “game” room in the spare room) we have a bunk w/ a double on the bottom and a single…they have wonderful bright quilts made by grandma…I just need to decide on a paint color. 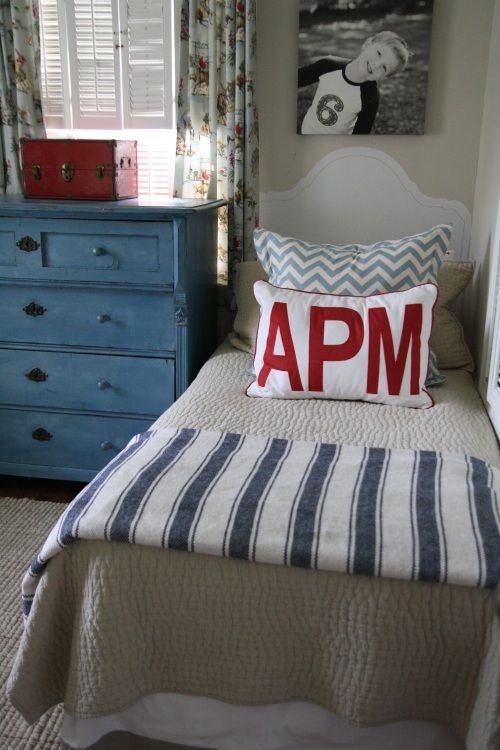 Love the monogram pillows…very inspiring! HOLLY! as usual, you knocked this one out of the park! it looks amazing! so cozy. so boyish. so not too boyish. WOW! love it! Perfection, Holly! This is a classic example of your style. I saw a teeny tiny thumbnail size of this room on Pinterest and knew it was your work right away! Great resources, too. I may have to contact the pillow sham gal when she’s back. I’m working on a room that will take Hallie into her teen years and am needing some fresh inspiration! Love the room!! The cowboy window treatments are adorable! Every room element is wonderful and overall effect is perfect! With hindsight, my boys rooming together was one of the best choices we made!! oh, Holly, it’s gorgeous! I love the light blue with the red! I absolutely love it! I looked at it like three times, just to catch all of the details. Well done! 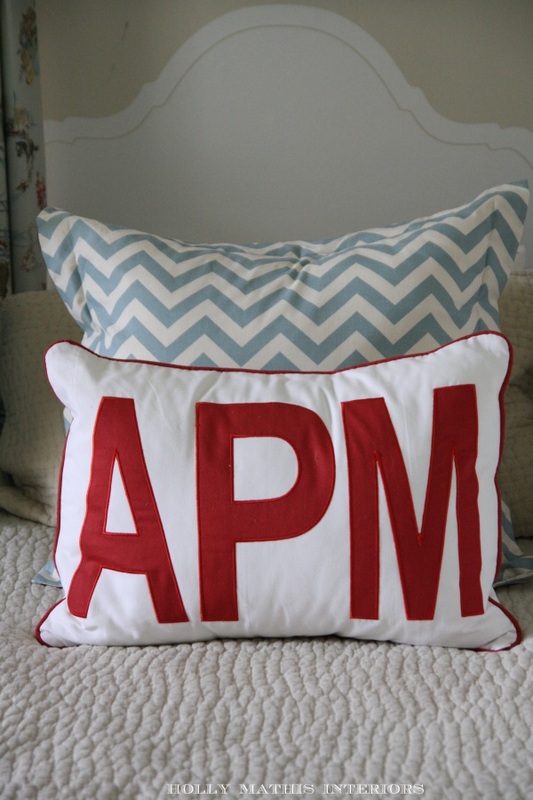 I especially love those monogrammed pillows with the chevron behind them! Congratulations! I absolutely love it. The bedding especailly. You did such a great job. I would copy everything if I could! My favorites are the curtains (still) and the monogram pillows. What a darling room. WOW! What a great room! Love all the details and the vintage army house. And the verse you selected. I’m thinking those boys of yours are going to grow up to be big strong oaks!! OMG!!! Holly, this room is AWESOME!! You a one amazing designer!! I meant “You are one amazing designer”! those pillows are todiefor amazing. Love it! I have the same quilt on my bed. I love them so much I’ve had 3 in a row. What a wonderful space to grow up in. My girls are sharing a room too and we’ll be moving the last crib out this winter for twin beds. This is great inspiration! Holly, The room is terrific but most important are the memories and good times the boys will have in it. Our boys shared and now at 20 and 22 are still close. We loved listening to them talk, tell stories and giggle together before they went to sleep each night. Great job. i think my favorite thing are vintage army barracks! i still love those cowboy curtains and you’ll need to show us when you finish the drawer labels..cute, cute. Holly wow fab job for the boys room!! Great palette and fabrics!! Lovely, lovely room. I am currently working on my room and trying to decide on what color bed ruffle with a beige rug and white comforter. (If you have any comments please speak up). I tried to use your tag to your Etsy person but it didnt work. Could you send me her address? Love your boys’ room! It has such a sweet spirit about it. 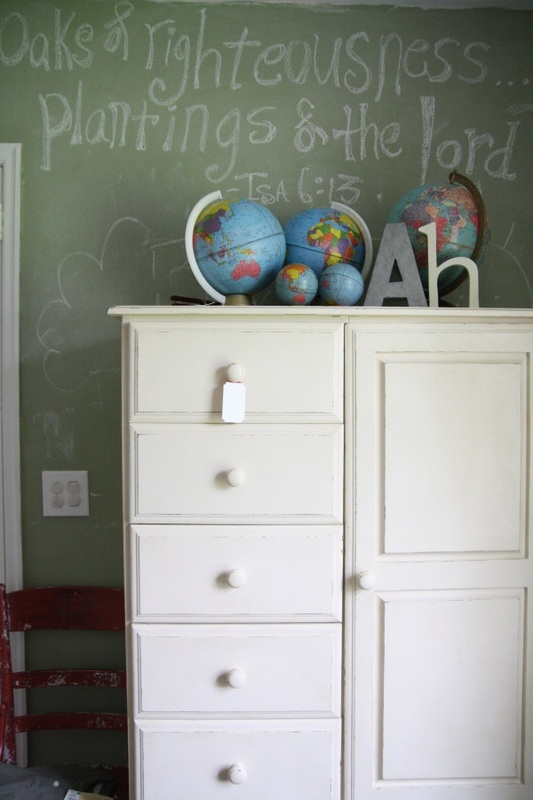 Your design it seamless and I love the antique dresser and hymnal rack and especially the scripture verse in Isaiah. Makes all the difference! ADORE! I really want to put 2 twins in my son’s room once he’s old enough for a “big boy” bed. You are so great at the boy’s rooms, I love seeing all the transformations over the years! Love this room! Great inspiration for my 2 year olds big boy room! Is there a paint color that you could suggest to get a close match to the dresser? I know it’s an antique but I’d love to get as close as possible. Where is the actual beige quilt from? where have I been for 2 days? You have knocked it out of the park in this little 10×11 room. It’s such a great room – you did a wonderful job. I love all of the bedding and the fun curtains. I bet your boys really enjoy it. the quilt is the pick stitch quilt in sandalwood from pb and the dresser is an antique with old finish…if you love the color you might try Annie Selke’s Aubusson blue with some tweaks and waxing i think you can get similar! You.are.amazing. !!!! This room is beautiful, calming, playful, unique, and full of history all in one. I love it! LOVE! you make me almost ready for my little one to be out of his crib! Oh Holly, I am so in LOVE WITH IT! Each and every detail of the brother’s room is delightful. Thank you so much for sharing. I am seriously contemplating moving A&G into one room this summer. They move all their things back and forth between their rooms at all times and if there’s ever a season for brother and sister to share a room this has to be it. Thanks for the motivation! Holly, i have admired the rug you used here for a long time, but i was thinking of it for my dining room. Since you have it in a little boys room, could you give me your opinion on if you think it could work in a d.r.? Thanks! Adorable! Everything in the whole room. So cute. This is such a beautiful spot for your boys. They will have such fond memories no doubt. You are very talented. LOVE your boys’ room! Did you mention the paint color on the non-chalk board wall? It looks so nice! Can you email me that info? Maybe you posted this elsewhere, or I missed it, but what is the paint color in here? It’s perfect for a small room! Girlfriend. I LOVE the boys’ room. It looks so GREAT! I love all of it so much. Too bad about the PB lockers! I’ve been admiring them forever! I LOVE them. But, good to know that they didn’t look good in person. Now I can get them off my mind. LOVE this room, all of it, but especially the rhino head on the wall, please tell me where I can get one! Holly – Just came across your boys bedroom! A-dorable! God just blessed us with our second boy and I went ahead and did my oldest big boy room to prepare for this one to add in a year or so after the crib. Cannot believe your verse choice for your boys! Love that verse! So much a prayer for our little men that this second bundle we named “Oakes” after the verse! what color is the dresser? I adore this room. I have a 6 yr old and 7yr old-both boys and it’s time to change their rooms up. They are tired of their rooms looking “baby”. Would love to use this room as inspiration. I like the room color a lot. Can you share the name and company you used? LOVE! LOVE! LOVE! Question…what color are the walls? Hi there. I’m a recent newby to your blog and LOVE the deco here. Where are the chev pillows from? The etsy shop friend? Looking to duplicate these ideas with black/expresso bunk beds. Thanks! yes they are from the TOOTLEDOO shop on etsy.but if you search blue chevon on etsy you can find many people who would make them i bet.,.its a common fabric from Premier designs. Can you please share the name and company of the paint color you used? Love Love Love that dresser!!! Oh my gosh – I will have to find something similar and restore it!! I too have two boys, ages 7 and 11 in a similar sized room that I am currently remodeling. What are the dimensions of that dresser? It looks very wide!! Thank you for such an amazing post!! Hello! Can you please tell me what color green the chalkboard wall is? Is it the standard schoolhouse green you can find premixed…or did you pick out a specific color? I tried the schoolhouse green and it looks too dark. Beautiful room!! I love it!!! I have notice that there is no desk , I’m guessing not enough space. What would be your choice of a desk to put in that room. TOTALLY LOVE!!! I am doing two separate bedrooms for my boys right now. 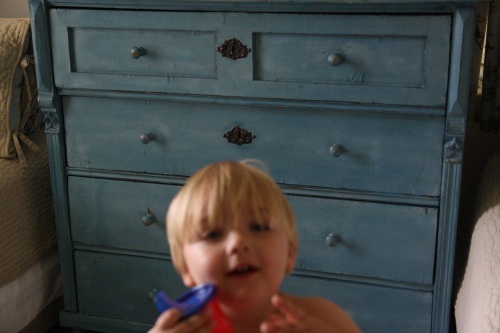 On another note, I love the blue dresser. It looks like French Enamel by MMS Milk Paint. I painted end tables that color and accented them with bright red accessories. I’m in love with that color combo! The entire room is amazing and beautiful ! I love the color of the dresser , if it was painted can you please tell me the color. If not do you know of one that close? where did you get the dressers? if you painted them yourself, what color? are they antiqued? I love the room! Especially the curtains. Where did you find the cowboy curtains?